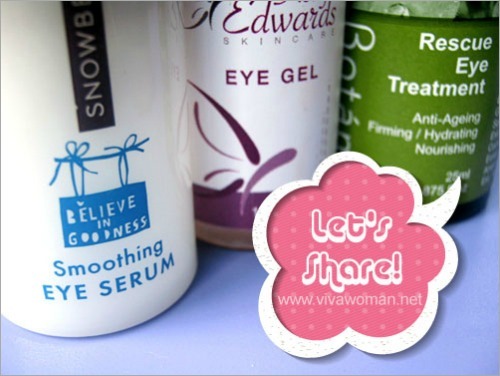 How many of you would agree that it’s a challenge to find a good eye serum or eye cream? It’s even harder to find one that is effective and yet affordable. Many of you would probably have realized by now that the phrases “over-promise” and “under-deliver” usually go hand-in-hand in this category of skin care. 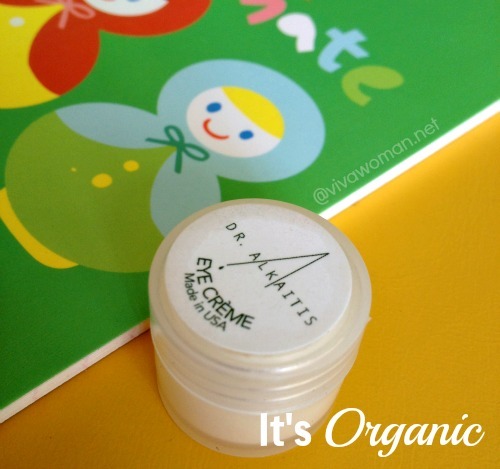 But today, I’m going to introduce you to not one, but two eye products from iHerb that are not only effective, they’re practically going for a song. I was a little skeptical when I first read the reviews but because they were so cheap, I figured that I won’t be wasting too much money if they really don’t work for me. And let me tell you, they’re great stuff! I doubt many of you have heard of the brand, Reviva Labs. I haven’t till I stumbled upon them at iHerb. But they’ve apparently been around since 1973. What’s interesting about the company is that while they’re small, they were able to introduce many skin care firsts before the cosmetic giants introduced their versions–concepts such as exfoliation, stablized vitamin C, elastic, etc. They also formulated their products without resorting to animal testing, way before the topic became mainstream interest. More importantly, the ingredients used in Reviva Labs products are pretty impressive but yet, they won’t cost you an arm or a leg. So this is not a just a brand that formulates skin care products in the natural category, but one using the latest technological advances as well. Reviva Labs has a couple of eye products and the two I purchased were the Reviva Labs Firming Eye Serum and the Reviva Labs Eye Complex Firming Cream, which I’d chosen based on the excellent ratings and recommendations from different reviewers. This eye serum contains many potent ingredients namely, DMAE, Alpha Lipoic Acid and Vitamin C Ester, all working together to reduce the appearance of eye area wrinkles, puffiness and dark circles. I had my initial inhibitions about getting this one because it contains silicone but it has served me well. I’d planned to use this in the day but because of its creamy texture, it ended up making my undereye area looking somewhat cakey with my makeup. So I used this in the night now. Demineralized spring water, Olive Oil, Cyclomethicone, Whole Wheat Protein, DMAE Bitartrate, Mulberry Extract, Lime Extract,Alpha Lipoic Acid, Ascorbyl Palmitate, Hyaluronic Acid, Allantoin, Xanthan Gum, Cetearyl Alcohol, Ceteareth 20, Potassium Sorbate, Sodium Benzoate, Citric Acid. This is described as a delicate eye cream containing a herbal complex for firming, plant extracts to improve circulation and vegetable oils to aid dryness. I like the ingredient list of this eye cream because unlike the serum, it does not contain any silicones. 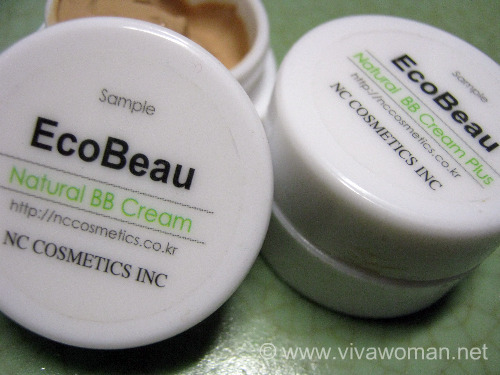 In terms of texture, this one is a cream but it is light enough to be absorbed into the skin quickly. In fact, I was even able to use both the serum and the eye cream together at one stage. Water, Glycerin, Sorbitol, Whole Wheat Protein, Compound of (Red Vine, St. John’s Wort, Arnica, Witch Hazel, Horse Chestnut, Ivy), Wheat Germ Oil, Sweet Alond Oil, Calendula Oil, Carbomer 934, Castor Oil, Cornflower Extract, Potassium Sorbate, Sodium Benzoate, Citric Acid, Fragrance. I’m sorry I do not have a before and after picture to show you. The reason is because I wasn’t expecting anything significant to happen and so when I got this last year, I just didn’t bother taking any pictures. So you just have to take my word for it or go read the reviews of others who have used these two products at iHerb. I’ve been using these for well over six months now although I did take a break from using them when I was testing other products. I started them at a time when I was very dismayed with the state of the skin around my eyes. They were looking wrinkly, dry and my eyebags were very obvious. 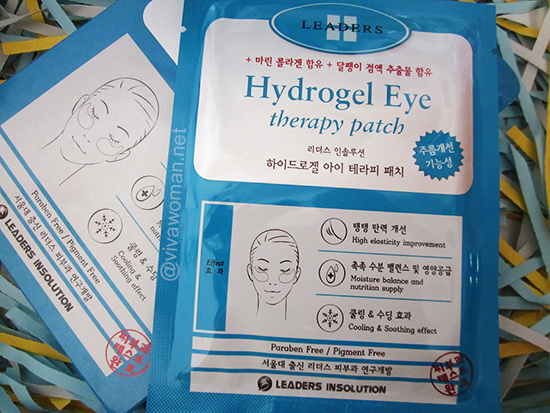 When I say eyebags, I don’t mean puffiness but real bags as a result of aging. So we are talking about something not so easy to correct with mere products. What I’ve found after using these two products is that my eyebags looked significantly less obvious. Wrinkles around the eye area are still there but many fine lines seemed to have smoothened out. I don’t have a big issue with dark circles so I can’t comment too much. But overall, I think my eyes are looking more youthful than before and I’m less dismayed about the area now. As a matter of fact, they don’t look too bad even when I don’t get enough sleep. I got both products because I was planning to use the Reviva Labs Firming Eye Serum in the day and the Reviva Labs Eye Complex Firming Cream in the night. However as mentioned, the Firming Eye Serum didn’t work so well with my makeup and so I now use it only in the night. At one stage, I used both together and they were fine, meaning I didn’t get any clogged pores or milia seeds. But as I became lazy, I started to use one or the other. 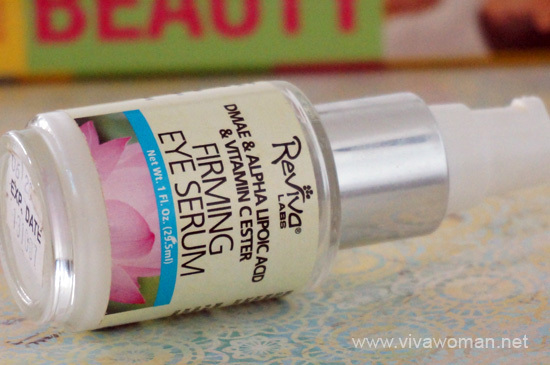 However, if you ask me, the Reviva Labs Firming Eye Serum has a slight upperhand because of the packaging; I definitely like pumping out my eye serum over digging into my eye cream. 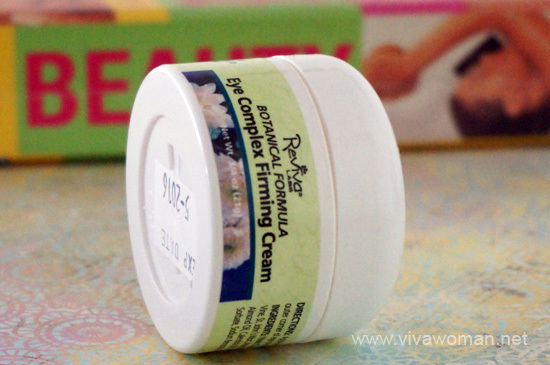 Yes, the packaging is friendlier compared to that of Reviva Labs Eye Complex Firming Cream. The only thing I dislike about it is that it contains silicone. In terms of rating though, Reviva Labs Complex Firming Cream has garnered 4.5 out of 5 stars rating from 452 reviewers, compared to 4.5 out of 5 stars from 143 reviewers for Reviva Labs Firming Eye Serum. But I haven’t verified the higher number of reviewers might be because the Complex Firming Cream has been around longer. Still, I’ll say both have good ratings and you can take your pick of either, depending on your preference for serum or cream, or like me, purchase both since the prices are very affordable. But going forward, I may just replenish the Reviva Labs Complex Firming Cream because I like its ingredient list better. 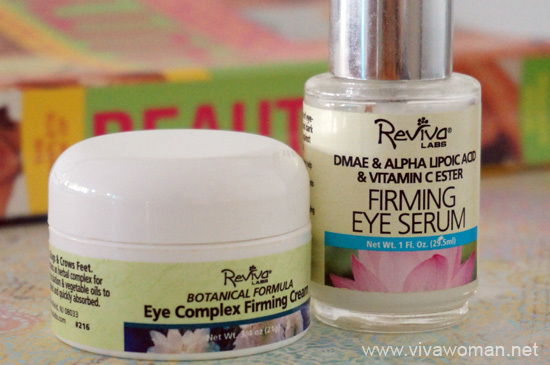 Get Reviva Labs Firming Eye Serum and the Reviva Labs Eye Complex Firming Cream from iHerb. If youâ€™re shopping at iHerb for the very first time, you can enjoy US$10 off if your purchases are $40 and above (US$5 if below $40). Use my promo code OVO966 (affiliate). Shipping is speedy: you have a choice of using DHL, which takes three days to arrive from US to Singapore. I pay US$4 for the shipping via Singpost and it always takes about five days with no issues. Anyway, you’re given a tracking number if you ever need to locate your parcel. Dear Sesame, sorry I have to bother you about this. But I wanna know if you know something about this. But I cannot find out how to get the free shipping. It just does not show up in the checkout cart. As you are also an international buyer, do you know anything about this? Oh, I didn’t get that! I just checked my shopping cart but I don’t see this. It is still the $4 charge or DHL. I wonder if it’s restricted to certain weight. I think it applies only to the “plain/standard” International Airmail without tracking. I got this email too (I live in Europe and only have the International Airmail as a shipping option for my country) and already placed an order with free shipping. I wonder if the international applies to those outside of Singapore though because we already have this $4 shipping option. But their message is quite confusing. So you liked the Eye Cream… I have to say that I was disappointed by it. I bought it twice (once when I first discovered iHerb and once a year later because I had forgotten I had already tried it!) and both times I was not happy with its results. 🙁 Admittedly I did not use it for that long, but I rarely test-drive an eye cream more than 2-3 weeks. I was looking (and still am) for something to reduce puffiness and soften the fine laugh lines I have, but this one was not it for me. By the way, I am now in the testing period of an eye cream I got from Vitacost. It’s from their own GloNaturals line, called Argan Collection Eye Cream. It has a pretty good ingredient list, a very fair price and I really like it so far. I haven’t shopped at Vitacost. I went to the site once or twice but still ended up back at iHerb. But I’ll take a look at the one you mentioned. I think I’ve seen that brand around. 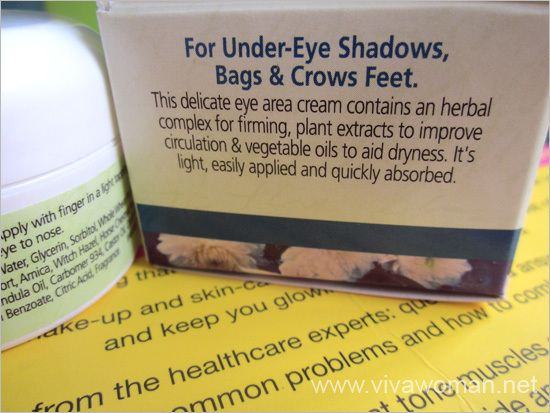 Hi Sesame, I am looking for water based eye cream as I suspect the eye cream I used cause millia seeds, oily bumps. Is Revive water based? I see water as the first ingredient. What water based eye cream would you recommend? Yes, Revive’s is lotion like so it’s not oily. I agree that itâ€™s a challenge to find a good eye serum or eye cream. I am 32 and I have been looking for this sort of product from quite a long time. I tried so many brands and products but those all were just useless. I have heard that Reviva Labs is a good brand. I will surely try it out. It also seems quite affordable. I am personally using Reviva Labs – Eye Complex Firming Cream, this is the Best eye cream from the price point and I’ve been able to find until I get around to making my own. My eyes get very puffy & definitely notice a difference using this. That’s great! I’m glad you’re seeing a difference.